Well - Unfortunately, my 19 year old son "accidentally" hit someone at work on Monday. He was leaving work and looked up, didn't see anyone and looked down to change his radio station...not a good idea. Another guy was walking to his vehicle and thought that my son saw him and thought he was messing around with him...urgh - nope, neither of them even knew what happened. The guys soda ended up on my sons windshield and my son looked in his rearview mirror to see the guy pulling himself up off the ground...oh man - how distraught my son has been. Thankfully the guy is going to be ok, he's got a cut about 1.5 inches long above his eyebrow and has some sore ribs but I'm so glad he's ok. The ever looming question of whether the guy is going to sue him or not is also weighing on my sons mind. 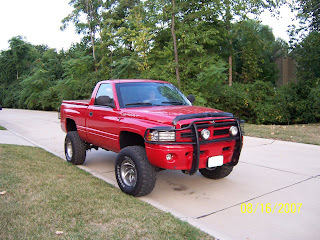 Thankfully the brush guard isn't on there anymore which could have been fatal but would you want to be hit by this??? Please if you read this, pray for my son Michael and for this situation. Wow.... let me know what happens.